Born in 1987 in Portugal, lives and works in Lisbon. 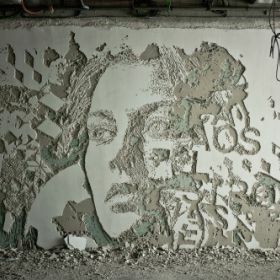 The work of Vhils revolutionizes stencil technic with surprising tools and medium: billboards, walls and wood panels are attacked by chisel, jackhammer, acid or explosives. In this way, Vhils aims at "scrub" the surface of things to reveal what is hidden under our world superficiality.